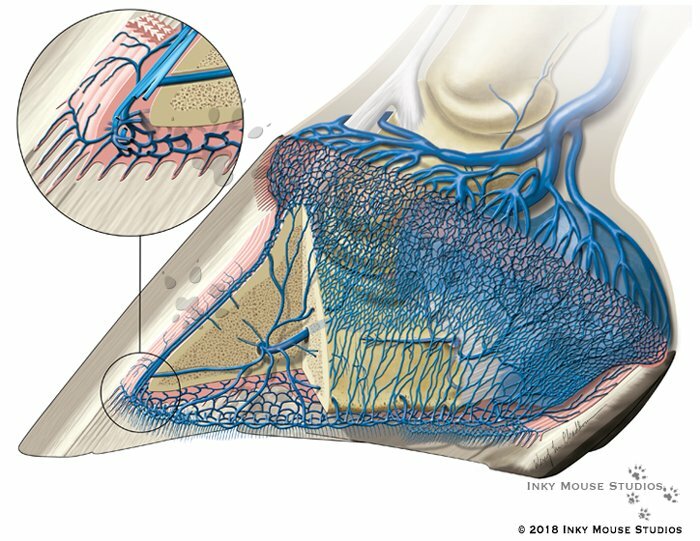 This illustration helps explain the biomechanical pump that the venous drainage creates within the equine hoof. This is the lateral view of the venous vasculature. It is one of a series of illustrations created for Dr Joanne Kramer who teaches at the University of Missouri. The complete series of illustrations will accompany various clinically important images. Ultimately to help the viewer differentiate the various components of the lamellar circumflex junction. For visual clarity, the arterial and venous systems are broken out into separate illustrations. The other illustrations in this series are hemodynamics venous blood flow within the equine hoof, the circumflex vessels arterial vasculature dorsopalmar view, and the circumflex junction arterial vasculature lateral view. Why is the biomechanical pump so important? The arterial blood supply is critical to delivering oxygen-rich blood and nutrients to the hoof tissues. The venous drainage system is just as important as it drains the oxygen-depleted blood and waste products out of the hoof and up the limb. Given the effects of gravity and the distance this takes place from the heart, there needs to be an effective way to get the job done. The biomechanical pump is powered by the movement of the horse. Every step results in cyclical loading and unloading of the hoof. Consequently, the pressure within the hoof capsule increases by loading and decreases by unloading the hoof with each stride. As a result, the increase in pressure pushes the blood out of the hoof tissues and back up the leg against gravity. A network of extracapsular semilunar valves within the veins prevents retrograde blood flow back into the hoof. As a horse owner, I understand the importance of movement to the health of a horse. Their bodies are simply designed to live on the move. The health of the hooves, and therefore the health of the horse, relies on the biomechanical pump illustrated above. The health of their digestive tract and respiratory system also rely on movement. As an illustrator, my knowledge as a horse owner deepens the understanding of these complex body systems as I strive to illustrate them. In conclusion, biology always finds a way to do some rather amazing things, and I am grateful I can help explain them.